Hubby now lives in the dog house. It is official. He has come close to moving out several times over the past few years. Now, he has gone and done it. Doggone it. Don't worry about our beloved dog. He is cheerfully willing to move out of the dog house in favor of an air conditioned home. The first photo you see is of my beloved Hubby in his new home. The second photo you see is of my beloved PT Cruiser. This is the car that got me to Alaska and back. My PT Cruiser and I have done great things together. We've to Florida, North Carolina and a bunch of other places. Until this date my faithful little car has made it through snow, sleet and driving rain without incident (except for a timing belt). You can't tell too well from the photo but that's torn fiberglass. It wasn't just pulled apart at the seam. To be fair, Hubby has offered to fix the car with duck tape. If he does that the wife is promising to post photos of the allegedly fixed PT Cruiser here. And there. And maybe on There I Fixed It. And on TwitPic. Once Hubby is able to emerge from the dog house he promises to take said PT Cruiser to an auto body shop. Unfortunately for him many auto body repair shops aren't open on weekends. 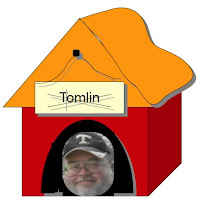 Tomlin, who is our real dog, seems to be ok with that. The wife who owns the PT Cruiser is not. What will this all mean for Hubby, the dog house and the beloved PT Cruiser? We'll get back with you on that. Uh oh. Looks like he'll have to find a way to be comfy in the doghouse. Hang it up dude. You gotta beg for mercy on this one.